So according to rumours Cardinal Burke is off to become Cardinal-Patron of the Order of Malta. It is hardly surprising considering his opposition to the new orthodoxies. If anyone has presented himself as the 'loyal opposition' it is Burke. Magister points out that he unlike many other Curial Cardinals has maintained his integrity and that is what I have heard from Rome. He is a Nathanael, 'an Israelite without guile'. Others might jockey for position, like renaissance princes, playing the Machiavellian games that are as much part of the Roman scene today as they were five hundred or a thousand years ago. Ratzinger might well have appointed his enemies to key positions, so long as they could hold an intellectual position together but things are different now, broken corpses are now on display in the city squares. It is not necessary for the Prince to say anything, or even to know his policies, it is actions that are important and being part of his party. It is not the law but the style of interpreting it that matters. The signs of the times are more important than spoken words, the nuance than what is actually said. The straight bat of Burke was hardly going to survive for long in that environment. Machiavelli, some clerics bedside reading, calls for examples to made, for occasional acts of cruelty, for signs of the Princes ruthless power. What seems to be being said is that the age of dogma and doctrine is dead, everything is pastoral, focus groups replace creeds, there is more concern with how we are conceived by public opinion than any teaching. Contemporary theologians, Kung or Martini are obvious examples, have like those American religious 'moved beyond' Jesus, the Church, archaic formulas, archaic documents, statements or examples of dead men. What we are now concerned with is the 'lived experience'. In the New Pentecost, the age of the Spirit, that has superseded the age of the articulated Incarnate Word, it is the experience of women and men. The pneumatic, blow where it will Spirit is all that matters. Traddies might understand the 'Spirit of Vatican II' as wild and irrational, 'do what you like' but it is far from that. In is about synchreticisn, dialogue, moderation, compromise, ambiguity, recognition of ignorance, the preference for the via negativa, the rejection of the via positiva. Christ and the Apostles might be unambiguous about judgement, heaven and hell, about Him being the only Way, Truth and Life, about the necessity of Baptism and the Eucharist, about objective realities but in fact 'we have moved beyond' all of that. That is no longer the default position of the Catholic Church. 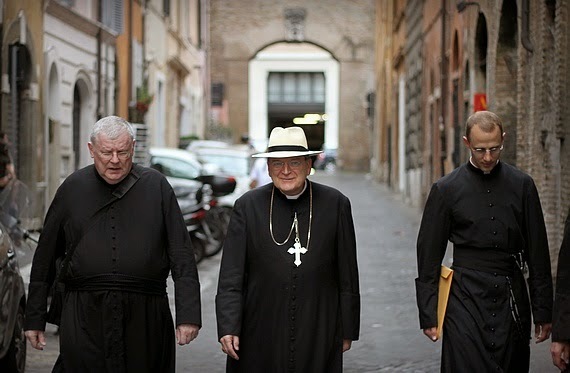 In that sense Burke and I suppose Ratzinger are the unwelcome voices of the past, increasingly it appears there is no place for them or the followers. Like the old Pope in isolation they await their demise! It is extremely hard to imagine that we all receive Christ in the sacraments and yet from most of my fellow Catholics springs forth rivers of incipient drivel. Oh, just to be clear, I don't mean you. I mean this other sort, who appear to be consolidating their power. And I await Pope Francis, and the modernists demise! How long, oh Lord, how long! Mater Ecclesiae, ora pro nobis! I used to think I was a confused Catholic. Now I'm not so sure. 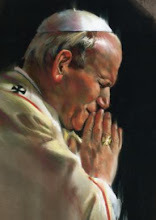 I am just reading Open Letter to Confused Catholics by that most despised of men (in some's eyes) Archbishop Lefebvre. I believe he wrote this in 1986, when many of the VII changes had become established. That is, nothing is established, everything changes. He saw this as the Lutherisation (if there is such a word) of the church and his arguments for this position are quite strong. As I see it, following a brief lull, it is all happening afresh. I had hoped the Catholic Church would return to holiness before I died. I doubt now that it will. I fear it will get a lot worse. One wonders, what would it look like if the gates of hell actually DID prevail against it? How much worse could it be? I am surprised that the good Cardinal lasted this long. The personal appointment by the Pope of Cardinal Daneels to the Synod on the Family is an even more worrying symptom of what we can expect in the coming months/years. Our Lady of Akita's prophecy that 'cardinal will oppose cardinal and bishop will oppose bishop' appears to be about to come true, if good men stand their ground. I trust in Christ's promise to be with the Church until He returns. This is my faith, my hope, and we shall see many martyrs. This is the age of martyrs and the remnant. Why are people sad? Get holy, be the strong ones, evangelize, do what God calls you to do. Faith leads to hope, not despair. Despair is from the evil one. These crises will separate the real Catholics from the false ones. The false one will support the evil. The real Catholics will shine like stars in the darkness. A simply excellent piece. Thanks. I love Cardinal Burke, and I am grateful that he was my Ordinary. Clarity always helps. We must stand firm and pray. Yes we say that, its an easy mantra. High Church Anglican Divines repeated it during the Reformation. Despite what the King and the Bishops and the clergy were doing and saying. What does it mean 'Truth remains true' even if the contrary is taught. The default position of the catholic church is the same as it has always been -but these modernising heretics in power at the moment are dragging it through the mud.They are the aged ,dying bunch of the vatican 11 hippy brigade.This is their last attempt at liberalising the church.May it fail soon!Our lady will crush the snake. God bless you father.Philip Johnson. Pope Francis is proving Arb. Lefebvre right. There is no via media anymore. It is just another consequence of the evil pervading the Holy See. It is all of a piece. The Deposit of Faith, the Natural Law is constantly being attacked whilst many are in a deadly state of denial. Silence in the face of objective evil can be interpreted reasonably as acquiescence. We may not be silent in the face of grave public evil threatening many souls. Blessed Michael defend us in the hour of battle . . . So Cardinal Burke is being sent away to rot in Malta and Cardinal Dolan is allowed to remain? Kaspar and his ilk are still allowed to reign? I know” "the gates of hell will not prevail" but this papacy seems to getting pretty close. Well, our Lady seems to be taking her sweet time with it...along with the Son. Wish they'd put on some speed. Some people need to get with the program. It is at times like these that I find solace in history, not so much in the golden ages (if they were even so golden), but in the darker times when it was really dark. Calvary was dark - all hope seemingly destroyed and the ‘world’ winning. The Ascension was dark - in a way - as feelings of being orphaned must surely have been felt. Much worse would follow with the martyrdom of the Apostles and thousands of others in the infant Church. History would repeat itself with persecutions, schisms and heresies waylaying the advancement of the Church - internally and externally – down to our present day. What to make of it all? Who can fathom it? As I near the end of this earthly life, with many of my contemporaries already dead, it becomes clearer to me that my first – and last objective – is to save my own soul. I can’t change the world. I can only pray for it to be changed. Though I find myself praying for the Holy Souls in Purgatory more and more – figuring, pace St. Therese, that I may soon be joining them. But only He can change the world and only He can save me. Popes, Cardinals, bishops will come and go, as will persecutions, abominations and heresies. Only He remains and in Him I put my trust. Otherwise I would despair. Yes indeed Terez, this is the beginning of Calvary for the Church. We most definitely see the persecution starting almost more now from the INSIDE than the OUTSIDE of the Church. I am afraid it will get worse before it gets better. As the Blessed Mother has said....'The Storm Must Come'.....hang on to your Rosaries! !